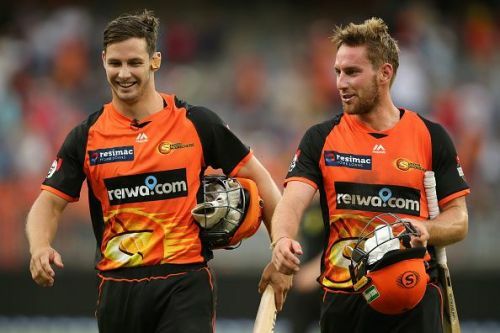 It was the seventh day of the Big Bash league 2018-19, and the action went to the Perth Stadium. 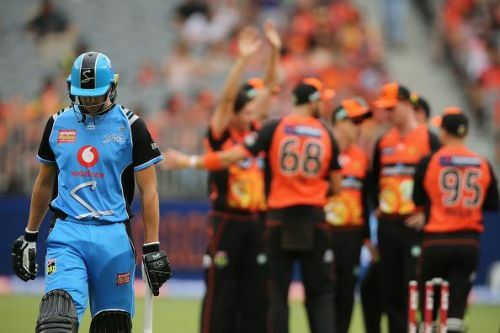 It was Adelaide Strikers who were playing their second away game this season, after having defeated the Brisbane Heat in the first one. As for Perth, they came home after losing 2 games on the trot against the Melbourne Renegades and the Sydney Sixers, both at their respective homes. The winners of the 2016-17 season finally caught momentum in their home, as they defeated Adelaide Strikers by 7 wickets. All the difference in the game was made by the bowlers of Perth Scorchers as they bundled up the opposition for a paltry total of just 88. Jhye Richardson was the pick of the bowlers as he had 3 scalps, conceding just 7 runs in his 3 overs, one of them being a maiden. Andrew Tye and Jason Behrendorff shared 2 wickets each while Coulter-Nile and David Willey settled for 1 each. It was a typical southward collapse for the Adelaide strikers as they went from 24 for no loss to 40 for 6. Though Adelaide possess a formidable bowling line-up, it was always going to be difficult for them to defend a score as low as 88. However, they were successful in stretching the match till the 18th over. Here are the things that Adelaide did wrong during the course of the match. In the early overs, Adelaide were going at a pretty good rate of around 6 runs per over. But as soon as the first wicket fell in the 5th over, there was a landslide of the batting order over the span of next 5 to 6 overs. No batsman showed the willingness to control the game or slow down and be there in the middle. Due to this lack of technique in the middle overs, Adelaide lost the plot of the match. All the batsmen had just one intention and that was to keep the run-rate ticking. In this process, the whole middle order succumbed. The second innings was a complete contrast when compared to the first one. After taking 2 wickets within the fielding restrictions, the bowlers from Adelaide could not take even a single wicket until the 18th over, which was terribly late. No one from the bowling line up could make an impact in the second innings. Rashid Khan, their strike spin-bowling all-rounder, though very economical, went wicketless as well. It was simply not the day for the Adelaide Strikers, but what cannot be ignored is the fact that they have a terrific bowling line-up on paper, as strong as any. However, they failed to strike the middle ground between attacking and containing the runs. Had they been more disciplined in their approach, the match could have got much closer than it got. This defeat can be considered an affordable one as it is still too early into the tournament. For Perth, they could have edged above the Adelaide Strikers in the points table, had they hurried a bit and finished the match earlier. As it stands now, Adelaide have gone down to 5th position while Perth climb up to 6th from the bottom of the table, after playing 3 matches each.